Blend up your favorite fruits and veggies for 30% less than you normally would with this deal on a juicer. Discount superstore Walmart is selling the Oster Juice and Blend 2 Go Compact Juice Extractor and Personal Blender for $35 (regularly $49.99). This Oster juicer features 400 watts of power, a stainless steel blending blade, a micro-mesh stainless steel juice extractor filter and a 50-ounce capacity pulp collector. 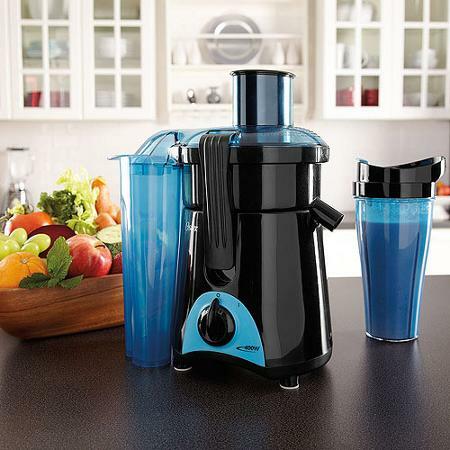 The black and blue juicer even comes with a 20-ounce BPA-free to-go cup with lid that you can use to take your juices and smoothies with you. If you purchase this and other items, keep in mind that the retailer offers free shipping on qualifying orders of $50 and more. Find this deal at Walmart.